One of the less than desirable features of the Power Grid ignition system is the use of a Micro USB programming port. Micro USB is the same type of connector many cell phones use which do indeed get a lot of use day in and day out, but in a race car where space is not as limited, a full size USB Connector would have been much better. Wear and tear on the USB port of the Power Grid can damage the internal connector, which is VERY difficult to repair. MSD will not repair the port as the unit is potted. There is no simple way to repair this ignition, if it's damaged it must be replaced, so it'll pay to be careful working with it. Almost any USB to Micro USB cable will work to connect to your Power Grid as long as it's a regular cable. If you have a "charging only" cable, that may not work as those may not include all the wires needed. One cable that I've used that works well is the StarTech.com Micro USB Cable - A to Right Angle Micro B (UUSBHAUB3RA) the Micro USB end seems to fit a lot tighter in the programming port than other cables I've used. These cables are available in both left and right angle Micro USB Styles, choose which side you want the cable to exit. Right exit will cross over the MicroSD Card Slot, Left Exit will exit to the other side of the card slot. If you want to minimize the wear on your programming port, you can mount the cable semi-permanently, for example the photo above. This uses the cable from Startech.com, the Right Angle Version, to exit the cable on the MicroSD card side of the plug. I ground a slot in the side of the plug to allow the cable to exit with the plug inserted. On the inside of the plug you'll see a ridge that is intended to keep the MicroSD Card in place, you'll also have to grind a slot at the front of that ridge for the cable to cross so that you can fully insert the plug. 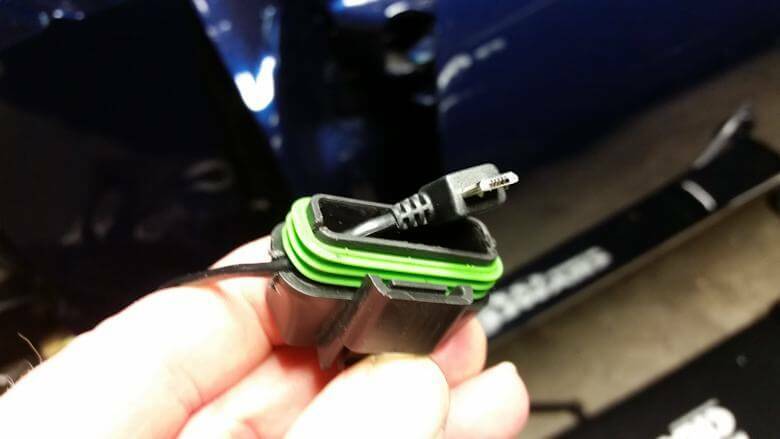 MSD does not recommend running the ignition with the cable plugged in, however many racers use it this way to avoid ruining their ignition box from repeated use of the Micro USB connector. It does make sense to route the USB cable away from likely sources of ignition noise to avoid problems with RF interference. Extra Long USB Cables - Move your Laptop to the Trailer! Tired of trying to view your laptop in the sun while programming your Grid? My solution was a extra long Plugable Brand USB 2.0 Active Extension Cable (Make sure to select the 32ft model) . I've used this cable for several years now and had real good luck with it. It's long enough to stretch from the inside of the trailer out to the car to extend the USB cable to a very handy length. Make sure to plug this cable into your laptop while you have an Internet connection in case Windows wants to install a driver for it. I've had no issues with Windows identifying the cable and automatically installing it. You might not have Internet at the track, so do it before you leave. 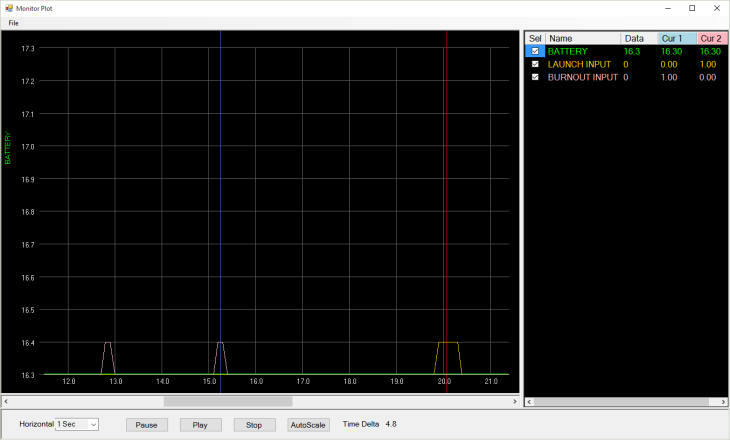 PTC now makes a 49 foot USB cable with active repeater which I've tested and confirmed it will connect with the Grid and my RPM Data Logger. That's a LONG cable for sure, it'll let you easily reach to the car from inside the trailer without issue. I've used this cable for two seasons so far without any issues, it's very handy if you want to leave your laptop in the trailer. MSD ships the Power Grid with a 2GB MicroSD, mine was shipped with a Kingston SD-CO2G and is FAT (FAT16) file system to be specific. These are getting somewhat hard to find as few people have a use for such as small memory card. Most cards now are much bigger, but the problem is the file format on the bigger cards are FAT32 which will not work with the Power Grid, it requires FAT file system (ONLY) which maxes out at 2GB of storage. You'll also need it to be a high speed Class 10 or better card, which means it has the ability to read/write to the card very fast. You can get a replacement card from MSD, but if you need to find one locally and can only find a FAT32 MicroSD Card in a Class 10 it can be reformated to the FAT file system and work fine. The card I used to replace mine was a Samsung Electronics 8GB EVO Micro SDHC with Adapter Class 10 Memory Card (MB-MP08DA/AM) . This card will need the partition changed in order to drop the size down to be formatted to the FAT file system. Note: The latest revisions of MSD View and recent 7730's are said to be compatible with NTFS formated cards and shipped with NTFS formated Cards, so the above formatting steps may not be necessary now. MSD says the biggest card you can use with the Grid is a 8GB, Class 10 Card so keep that in mind when getting one. Just for reference, this is the most up to date revision for MSD View, MSD ReView and the MSD Firmware Software released. If you connect to your ignition with MSD View, then click "HELP" then "ABOUT" you can see what release you have. One of the most useful additions in the newer MSDView4 software is the new Monitor Plot Window. Most of you have used the round gauges available to view engine RPM, Step Inputs, etc. on the right side of the screen, this is a new addition. MSD has really stepped up with this new feature. It's basically a strip chart recorder that will record data in real time. In the screen shot above, you can see the traces where I had activated the Line Lock (burnout input) and transbrake (launch input). This can be very handy if you're trying to troubleshoot things by yourself. You can also save the strip chart to a CSV file, and then later reload it into the Monitor Plot window! Cool eh? The software records events 10 times per second, while not super fast, it's good enough to be very useful. To use this feature open MsdView4, connect to your PowerGrid, then choose the Data Acquisition Menu Item at the top, then in the drop down, at the bottom you should see Monitor Plot Screen. Clicking on that will pop open the Monitor window. Just like the previous Gauge monitors tab, you have to check what data you want to view on the screen with the Monitor Tab. Finally, recent versions have a new green import settings button. This works in conjunction to an export feature listed in the File Menu. This allows you to export settings for example you can export your General Settings Tab, then import it later if you want. The biggest value of this tool is when working with curves, for example you can export your launch retard curve from one file, open a new file and import that curve without having to rebuild it. There's even more copy and paste capability too. Now you can copy a curve, like a launch retard curve, then paste it into another window. This can be very handy! Disclaimer: This article contains affiliate links, which means I receive a small kickback if you make a purchase using some of these links, or the ads on these pages. This money, what little there is, gets put back into maintaining and operating this website. If there's any money left over after that, it gets put into our racing program. You can trust that we would never recommend, promote, or suggest anything we wouldn't use ourselves.